Play Fest was established in 2011 by a mum who is committed to empowering families in the marketing of toys. How is this done, well currently there are two weekly Playfest Parties (Twitter on Tuesday and Facebook on Thursday) and simply put a group of people get together to talk ‘play’, there is a different topic each week and it is an opportunity to have your say, give advice, share ideas and even tell brands directly what you think of toys! The best bit about these parties is…..anyone is welcome, just join in! An now for some even better news, this week on Playfest Izziwizzi Kids has teamed up with Galt Toys to give you the opportunity to have your say on the brand and particularly on the Marble Run! There will also be a chance for one person (who pre-registered for playfest) to win themselves a Marble Run! We were lucky enough to have been asked to review the Marble Run on video for the playfest, but here is a quick write up of what we thought! 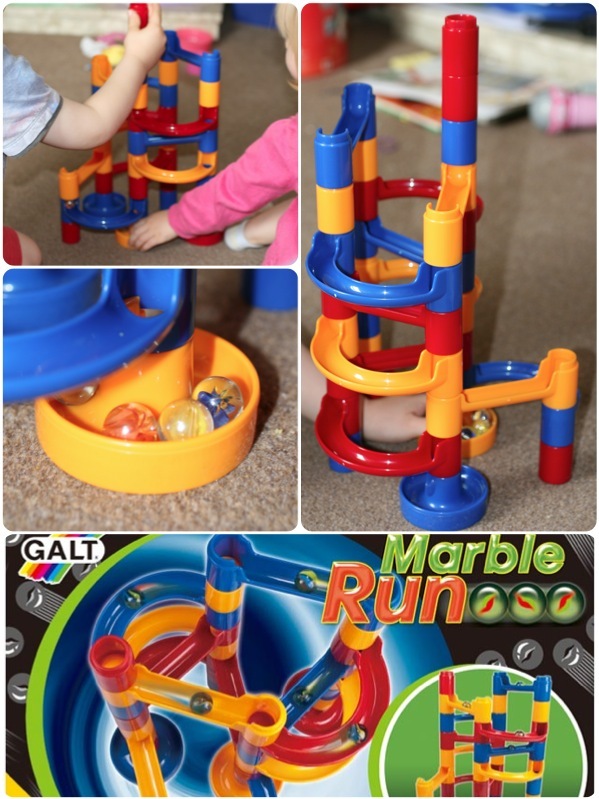 The Galt Marble Run contains 30 brightly coloured pieces. There are straights, curves, tubes and marbles! Unfortunately there aren’t any instructions so you have to get really creative to build your runs! Well we managed to build one (builders in the making) and got to playing! The game is for 4-8 year olds and I think this is pitched right, Mouse (2 years) is able to play it, but got very bored very quickly where as Legs (4 years) got stuck in and really enjoyed it! The pieces are sturdy and are definitely wipe clean, which in my eyes is always a bonus with toys! It is a really good concept for a toy and I think many children would love playing with it! So, there is a big thumbs up from Legs and a smile from Mummy! I was given the marble run for the purpose of the review!